"There obviously was a tremendous mistake made, and what compounded the mistake was the attempt to try to cover up," the official said. Saudi Arabia said Sunday that it had formally apologized to the family of slain journalist Jamal Khashoggi, even as its foreign minister called his killing at a consulate in Istanbul "a rogue operation" and denied that the kingdom's crown prince or intelligence service had any prior knowledge of the incident. "This was an operation that was a rogue operation," the official, Adel al-Jubeir, told Fox News on Sunday. "This was an operation where individuals ended up exceeding the authorities and responsibilities they had." 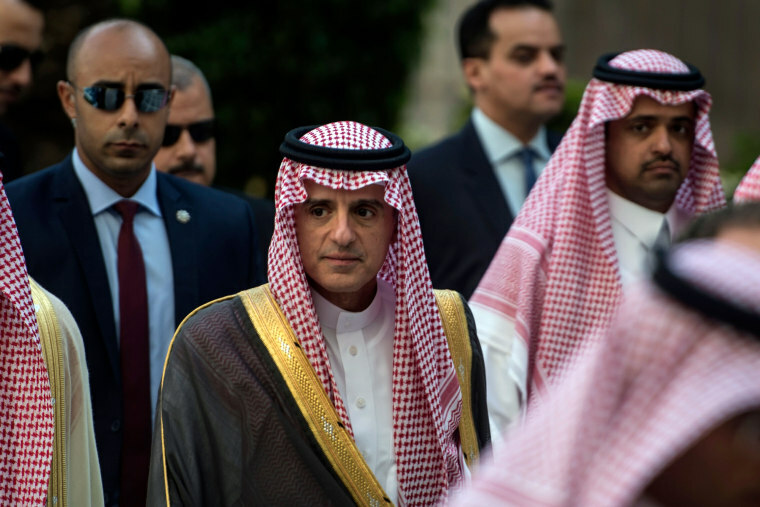 Jubeir said neither the crown prince nor "the senior leadership of our intelligence service" was aware of what had happened to Khashoggi, a Washington Post contributor. "There obviously was a tremendous mistake made, and what compounded the mistake was the attempt to try to cover up," he said, adding, "That is unacceptable in any government." Both Crown Prince Mohammed bin Salman and his father King Salman have called Khashoggi's eldest son, Salah Khashoggi, to express their condolences, according to the Saudi Arabian Foreign Ministry. This followed Saudi Arabia admitting for the first time Friday that the writer had died in the country's consulate in Istanbul on Oct. 2, and announcing that 18 Saudi citizens had been detained in connection with his death. Jubeir said Saudi Arabia wanted to make sure "those who are responsible are punished, and we want to make sure that we have procedures in place that prevent it from happening again." Jubeir also said the Saudis did not know the details of how Khashoggi was killed or where his body is. He added that an investigating team in Turkey found evidence contradicting earlier reports that Khashoggi left the consulate after his visit. According to Jubeir, the prosecutor determined "that the reports that were originally filed were wrong and that there was something that happened that was criminal." The fate of the regime-insider-turned-critic has ignited a firestorm of condemnation of Saudi Arabia's leadership, particularly the crown prince — the country's putative leader who has overseen a sweeping crackdown on dissent. Saudi Arabia's explanation on Friday that a "quarrel and fighting by hand" led to Khashoggi's death has been met with deep international skepticism. The kingdom's latest version of events, its numerous changes in narrative and the fact that Khashoggi's body still has not been discovered leaves unanswered questions, and prompted Republicans and Democrats in the House and Senate to call for the president to hold Saudi Arabia accountable. Turkish President Recep Tayyip Erdogan said Sunday that he would reveal more about the investigation on Tuesday. The White House said Erdogan and President Donald Trump discussed the case in a telephone call on Sunday. Trump offered sharper criticism of Saudi Arabia's explanation on Saturday evening, telling The Washington Post: "Obviously, there's been deception, and there's been lies." But Trump has also continued to defend the kingdom as an "incredible ally" and allowed for the possibility that Khashoggi's death was not directly ordered by Crown Prince Mohammed. Trump, who made Saudi Arabia a linchpin of his Middle East policies and visited the kingdom on his first overseas visit as president, has repeatedly brought up a major arms deal with the country that he says is worth $110 billion. Some of Trump's allies remain deeply critical of Saudi Arabia's response to the scandal. Sen. Lindsey Graham, R-S.C., said on Fox News that he did not think the Saudis' explanation was "credible at all." "It's ridiculous to believe 18 people would go to Turkey to kill Mr. Khashoggi and nobody in the government know about it," he said.